The 2016 presidential campaign has exposed class and education differences among Republicans. In several primary contests to date, billionaire Donald Trump has fared better among white Republican voters who have not completed college than among white GOP college graduates. A review of Pew Research Center surveys over the past several months finds that white Republican college graduates and white Republicans who do not have a degree generally agree on many political and policy issues. But there also are clear differences in their views on immigration, racial issues, politics and government, and business. Based on political surveys in 2015, white non-Hispanics made up a large majority (80%) of Republicans and Republican-leaning independents; white non-Hispanics made up a smaller share (65%) of the public overall. Among Republicans and Republican leaners, about a quarter (23%) are white college graduates. Nearly six-in-ten (57%) are whites who either have attended college but have not obtained a degree, or have not attended college. In Pew Research Center’s survey of attitudes about government, conducted Aug. 27-Oct. 4, 2015, Republicans overall were more likely to view immigrants as a “burden” to the U.S. than as a “strength.” This view was more widely shared among less-educated white Republicans than among those who have completed college. Roughly six-in-ten (62%) white non-college Republicans viewed immigrants as “a burden on our country because they take our jobs, housing and health care.” Just 26% said immigrants “strengthen our country because of their hard work and talents.” Among white college graduate Republicans, opinion was divided: 44% said immigrants strengthened the country while 42% said they were a burden. 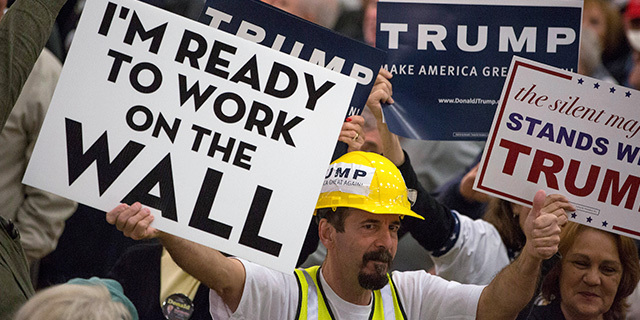 Half of white non-college Republicans said they would be more likely to support a candidate for the Republican nomination who wants to deport all immigrants living in the U.S. illegally, according to a survey last September. Among better-educated white Republicans, 38% said they would favor such a candidate. By a wide margin, Republicans favored building a fence along the entire U.S.-Mexico border. Support for a border fence was more widespread among white Republicans who have not completed college (75%) than those who have (64%). White Republicans with less than a college education also expressed less positive views of increasing racial and ethnic diversity in the U.S. About half (48%) said having “an increasing number of people of many different races, ethnic groups and nationalities” makes the U.S. a better place to live. Among white college-educated Republicans, 65% viewed growing racial and ethnic diversity positively. Our July survey found that most Americans (59%) said the country needs to continue making changes to give blacks equal rights with whites. Only about a third (32%) said the nation has made the changes needed to give blacks equal rights. Among Republicans and Republican leaners, 52% said the nation had made the changes needed to give blacks equal rights, while 39% said it had not. On this question, there were only modest differences in the views of white Republican college graduates (60% of whom said the nation has made needed changes) and white non-college Republicans (53%). Similarly, 32% of better-educated white Republicans – and 40% of those who do not have a college degree – said racism is a “big problem” in society. Among the total public, 50% saw racism as a big problem. There were much sharper differences over South Carolina’s decision to remove the Confederate flag from the statehouse grounds. By a wide margin (56% to 37%), white college-educated Republicans said the decision was right; by nearly an identical margin (57% to 36%), white non-college Republicans said it was wrong. Our survey on government found widespread dissatisfaction with politics, especially among Republicans. 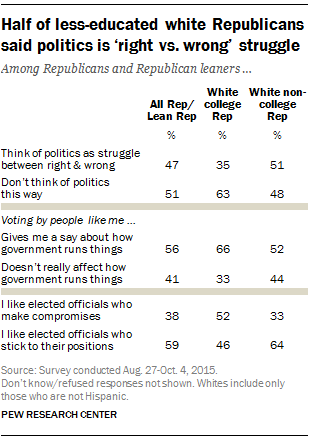 Fully 79% of all Republicans and Republican leaners said their side in politics loses more often than it wins. There were no significant differences on this question between white college graduates and whites who had not completed college or on whether they felt “angry” with the federal government. However, less-educated white Republicans were more likely than those with more education to view politics “as a struggle between right and wrong.” About half (51%) of white Republicans who have not completed college said politics is a struggle between right and wrong, compared with 35% of better-educated white Republicans. White non-college Republicans also were more skeptical that voting gives people a voice in government. More than four-in-ten (44%) said voting “by people like me” does not affect how government operates, compared with 33% of white Republican college graduates. Overall, just 38% of Republicans and Republican leaners said they like elected officials who compromise, compared with 59% of Democrats and Democratic leaners. White Republicans who have not completed college had a markedly negative view of politicians who compromise, with only a third seeing them positively. By contrast, about half (52%) of college-educated white Republicans had a favorable view of those who compromise. Previous Pew Research Center reports have found sizable socioeconomic divides within the GOP in views of the government’s social safety net, with less-educated and lower-income Republicans more likely to favor generous government benefits. In a December survey of opinions about the middle class in the U.S., less-educated white Republicans were more likely than white Republican college graduates to say the federal government does too little for older people (70% vs. 49%) and the poor (40% vs. 29%). Conversely, less-educated white Republicans were more likely to say the government does too much for the wealthy (50% vs. 37%). Notably, most white Republican college graduates (52%) and white Republicans who had not completed college (58%) said the federal government does too little for the middle class. Less-educated white Republicans were far more likely than white Republican college graduates to express critical views of business corporations and the fairness of the U.S. economic system. 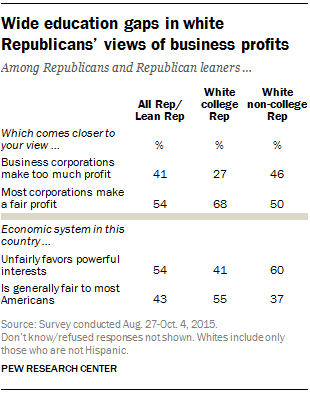 Half of white Republicans with no college degree (50%) said business corporations make a “fair and reasonable” profit, but nearly as many (46%) said they make too much profit. Among white Republicans with college degrees, 68% said corporations make a reasonable profit, while just 27% saw their profits as excessive. Correction: An earlier version of this post gave incorrect percentages for support of a border fence.